Improves the water quality by removing minerals such as sodium, sulphate, chlorine...sediment and bacteria. 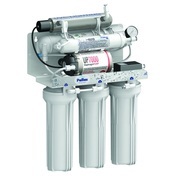 We supply two ranges of domestic RO, traditional undersink RO's and the more compact versions. They come non pumped, and permeate pumped (both non electric) and pumped (requires electricity). These RO systems produce pure water which is stored in small reservoirs for immediate supply. These systems all come with fittings and chrome effcet tap. Unpumped Reverse osmosis system requiring 3 bar inlet pressure. No electricity is required. Typically used in kitchens to remove impurities and give pure water. A modern tap and fittings are also supplied. Typically 150 to 200 litres of water a day can be produced which is stored in a small pressure vessel (8 litres) which is enough to fill kettles and pans. A Reverse osmosis system requiring 2 bar inlet pressure. Electricity is NOT required. Some of the outlet pressure is used to increase the inlet pressure helping to force the pure water through the RO membrane. Pumped Reverse osmosis system requiring 1 bar inlet pressure. Electricity is required. Similar to the unpumped version but works at much lower incoming pressures so ideal for gravity fed systems. Antibacteria double security. This system gives all the advantages of the pumped RO with the added advantage of a UV to remove bacteria. Compact unpumped Reverse Osmosis system requiring 3 bar inlet pressure. No electricity is required. Smaller than traditional RO systems so especially useful where space is tight. Pumped version o﻿﻿f the compact RO. Requires only 1 bar of pressure. Electricity is required.